Businesses can bring the materials listed below. Materials Accepted - Please sort according to the following types. Paper Products - Please sort the following paper products by type. #2 HDPE Plastic - Milk jugs, laundry detergent, fabric softener, etc. Note: Look on the bottom of your plastic containers for the "recycling" triangle to identify the plastic type. Be sure to rinse out any food or beverage containers! Note: Labels are OK. Be sure to rinse out any food or beverage containers! Note: Labels are OK. Any metal lids should be placed with your scrap metal. Be sure to rinse out any food or beverage containers! 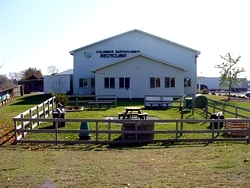 Clean vinyl siding will be accepted for recycling at the Columbus/Bartholomew Recycling Center. Vinyl siding should be free of nails, insulation, etc. Residential or Commercial quantities will be accepted. Please stop by the District Office for direction to the bins for recycling.